This is where it all began. Ignoring the somewhat inane plot, UWOL's success can be attributed to it's fast arcade gameplay, simple premise and excellent presentation. 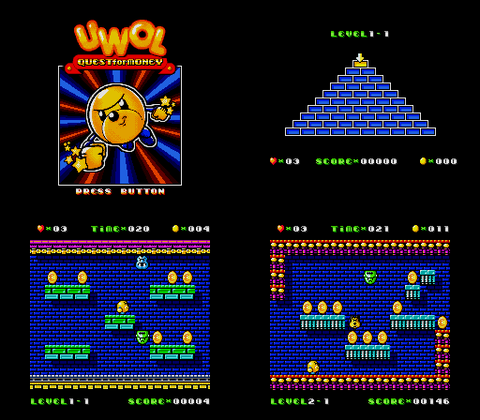 The game's concept is simple; working your way through a pyramid structure of levels (from top to bottom), the player must navigate through each single-screen stage and collect all the Euro coins whilst avoiding the enemies. Jumping from platform to platform, an interesting feature is that if you exit the screen on one side you reappear on the other, and some platforms actually require you to actually jump off the screen to reach them. 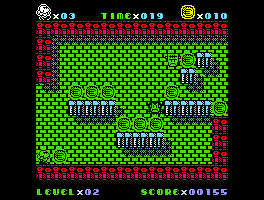 If you hit an enemy you lose your clothes (similar to the coin-op classic Ghosts and Goblins) and become vulnerable to a one-hit kill, and must find a t-shirt icon to replenish your armour. 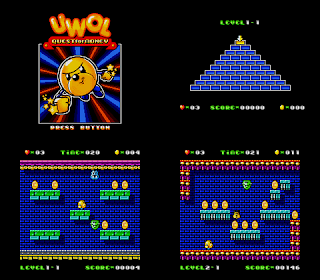 Setting UWOL apart from other similar platformers, at the end of each stage you are given an option as to which direction you wish to progress through the pyramid - but be warned; if you fail to collect the 255 coins required by the end of the pyramid, you are sent back up to the top and will need to collect more coins via a different route. This interesting addition means that not only is each play-through (potentially) different, you are always on the look out for the most rewarding route through the game. Download it here (from The Mojon Twins website). Surprisingly, one of - if not the first - port of the game was for Sega's 16-Bit opus. Out of nowhere, a Russian Genesis/Megadrive enthusiast using the handle 'Shiru' announced the release of his version of the game back in 2010 on the gendev.spritesmind.net forum. 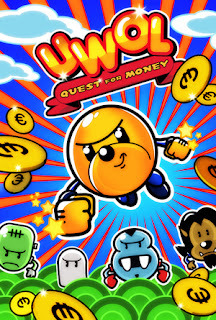 With the console's development scene being much quieter than the comparatively hyperactive 8-Bit community, his port of UWOL was met with great acclaim and positive response, despite the simple game hardly demanding much from the console's hardware. 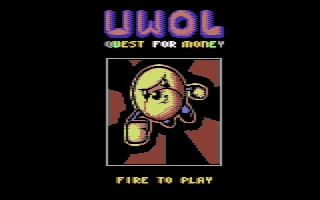 With greatly improved (yet still distinctively retro) graphics and audio, UWOL on the Genesis/Megadrive is actually one of my favourite versions to date. Download it here (from Shiru's website). 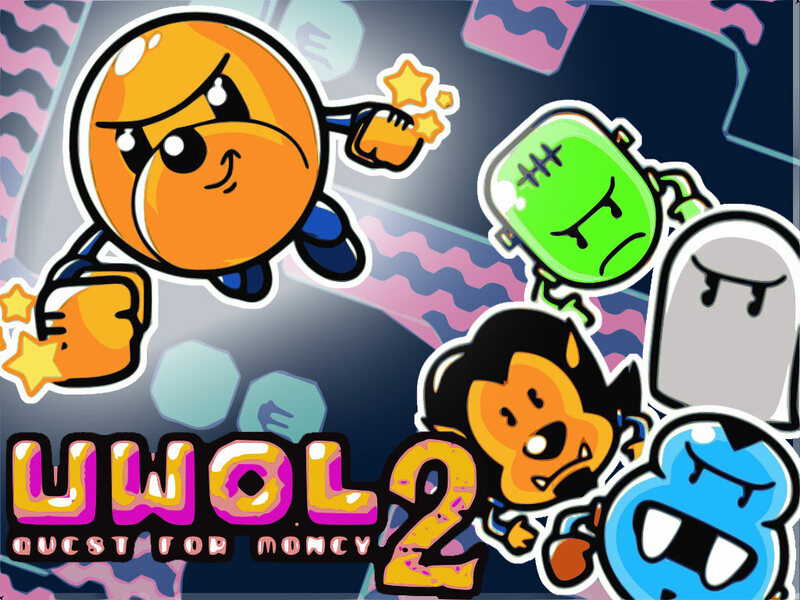 Run it using GENS (freeware). 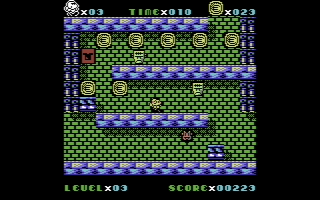 With the 8-Bit scene expecting a CPC conversion from the Twins as the next logical step, an appearance on the C64 caused quite a stir - primarily as it was the first time the prolific development team had released anything for the Commodore. Soon after the official C64 port, Assassins (long-standing heroes in the C-16/Plus-4 scene) blew up the competition by releasing an excellent 16KB(!) version for the unexpanded Commodore C16. When you put it up against the 128KB ZX original, it really is an amazing achievement and well-worth checking out just to witness what can be done on a machine with such limited hardware. 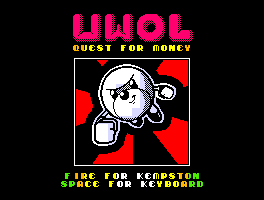 Two years after it's first appearance, UWOL was finally released on the CPC at the beginning of 2011 - although in the unexpected guise of a sequel to the original game (which is also expected to arrive on the Amstrad sometime soon). 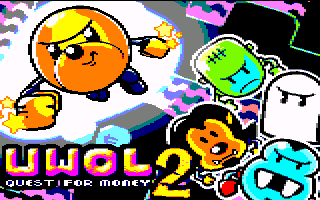 The first thing that becomes apparent in UWOL 2 is how different it looks; the graphics are far more varied and the Twins have done a great job adapting the visuals to suit the CPC screen mode. 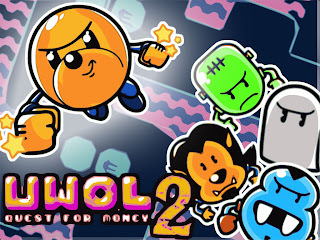 More surprising though is the fact that the sequel seems to have left the single-screen arcade style for a more interesting console-adventure format, with UWOL collecting coins by exploring through a multi-screen map and requiring keys to progress from area to area. 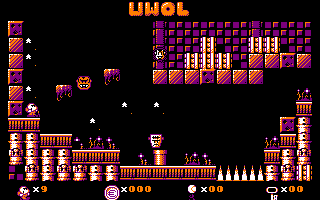 UWOL 2, although admittedly an evolution in the original design, doesn't sit so well with me (at least on the CPC). The game seems a little sluggish compared to the first game and lacks some of the it's instant accessibility. It will be interesting to see how it performs if/when converted to more capable classic hardware. So what platform will be visited by UWOL next? With CPC and Atari 8-Bit versions already known to be under development (link), it's only a matter of time before someone in the MSX community rises to the challenge. And who knows? Perhaps the game will even make it's way to the Atari ST and Amiga or more modern hardware such as the Dreamcast, DS or PC/Mac/iOS in the years to come? One thing is for sure; UWOL's quest is far from over. Thanks for the article from The Mojon Twins! Cheers.